Get the Labour Market Impact Assessment (LMIA) as easy as 1-2-3! Are you thinking of hiring a foreign worker? You probably need the Labor Market Impact Assessment (LMIA). It is the first step in the process when Canadian employers want to hire temporary foreign workers (TFW). The probability of approval depends on the job and the industry sector. Those sectors with shortages such as healthcare workers (caregivers) have a high probability of approval. Shortage in this sector is established. 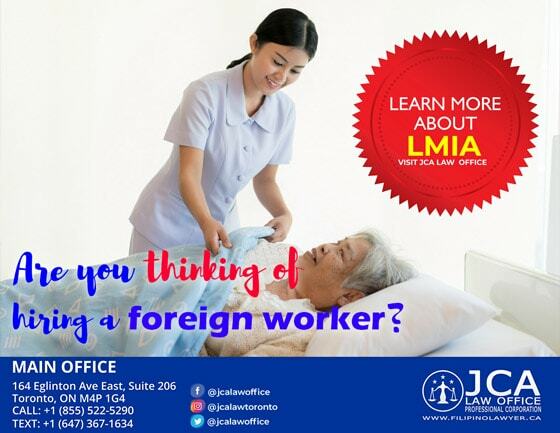 A positive LMIA for caregivers must be issued first before a TFW can apply for a temporary work permit. If you need a temporary worker, secure the LMIA Approval first. The usual question is “how long is the LMIA processing time?” It depends. Certain high-skill jobs can qualify for LMIA processing of 10 to 20 business days while, for the caregivers, it usually takes 60 business days up to 90 days. The processing by Employment and Social Development Canada (ESDC)/Service Canada can take much longer depending on each case. There are 3 steps employers can take to avoid delays in processing. Among the significant factors that influence the LMIA processing time is completeness and correctness of the lmia application form. The application form is very detailed because the government ascertains the necessity of hiring a TFW. It must be established that eligible Canadian citizen or permanent resident is not available or willing to take the job. In addition, ESDC needs to verify that the employer has a legitimate business, that there is an actual job available, and that the TFW is qualified to do that job offer. The employer must submit all the requirements at the time of the application. Otherwise, ESDC may return the application because it is incomplete or worse, ESDC may refuse the application. Employers need to prove that considerable efforts to search for an eligible Canadian citizen or permanent resident who might be qualified for the job were been made. The recruitment process is the most crucial part of the assessment as it involves specific timelines on the duration of the ads versus as to when the application is being assessed. The advertisement platforms must satisfy the requirements of ESDC. Some platforms are not acceptable. If an employer was declared ineligible by Immigration, Refugees, and Citizenship Canada (IRCC), the LMIA application will be rejected. Ineligible employers are those who has history of noncompliance resulting to revocation of an issued LMIA. Application may also be refused for reason of public policy. If there is a high unemployment rate in a region and an employer applies for a low-wage job LMIA in that region, the application won’t be considered. The LMIA process is simple for some in a sense as all forms and information can be found online. However, the assessment process is highly complicated because the government ensures that Canadians and permanent residents are protected. 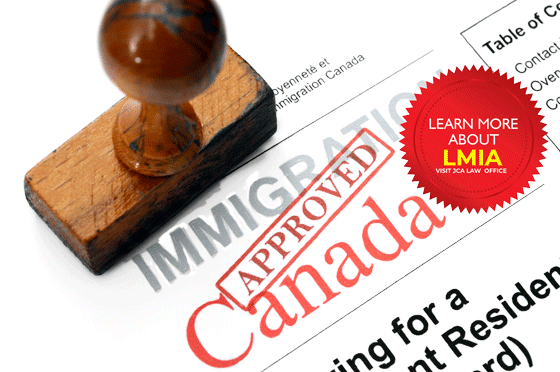 For this reason, many employers hire immigration professionals like JCA Law Office to help them with your LMIA Application in Canada. JCA Law Team handled a good number of approved applications. We assure our clients that the application is up-to-date. We take care of all the complexities of the matter from the initial stage of preparing the forms up to the assessment itself. Questions About Immigration? JCA LAW OFFICE has the answers. Our immigration services stay updated on all immigration news and announcements across Canada, including sudden changes in government law. Our legal solutions help individuals, families, and businesses within Canada. Immigration is a complex process that requires a strong legal strategy, precise and efficient submission of legal documents, reducing the risk of wasted time, money or permanent rejection. Let us start your Labour Market Impact Assesment (LMIA) Process today! We have a dedicated team of licensed professionals standing by, ready to answer your immigration questions and how to apply for lmia in Canada.